What Are You Going To Do With Your Extra Day? Have you ever wondered why we have a Leap Year? I don’t often get to date a blog entry February 29. It only happens every four years. This year is a leap year; it consists of 366 days, as opposed to a common year of 365 days. Leap years are needed to keep our calendar in alignment with the Earth’s revolutions around the sun. It takes the Earth approximately 365.242199 days (a tropical year) to circle once around the Sun. If we didn’t add a day on February 29 every 4 years, we would lose almost six hours off our calendar every year. After only 100 years, our calendar would be off by approximately 24 days! OK, perhaps the reason for leap year was not the most pressing thing on your agenda for today. But let me use leap year to make this point: with an extra day given to us this year, let us pause and think about all our days and just how precious each and every one of them truly is. One of the best things that can happen to us today is to be reminded that every day is a gift from God. The past is gone. The future is promised to no one (on this side of the grave). All we have is right now . . . this day. And that is why it is called the present. Today is a gift from God, and our gift back to God is the way we go about investing this day. So . . . what are you going to do with your extra day? Perhaps you have been putting off sharing Jesus with someone who doesn’t know Him. Maybe you have been planning to write a thank you note to someone special and haven’t gotten around to it. Possibly there is someone who is in need of your forgiveness and today is the day you ask God to give you the grace to do that. Perhaps there is someone from whom you need to ask forgiveness and today is the day to ask God for the courage and the humility to do that. Is there anything you have been putting off doing until tomorrow that you can do today? If the extra day this year gets us thinking about how we are using all our days, it’s a very good thing! The Bible speaks about the difference between the wise and the foolish. It is only the wise who understand the brevity of life and make it their goal to invest their days in ways that bring glory to God by advancing the cause of His kingdom, right here and right now. There really is no time to put off till tomorrow what God is calling us to do today! Let us all pause today and ask God to penetrate our hearts with this truth: may this “extra” day remind us of that final day! Because only God knows when that final day will come, let us invest wisely each precious, unrepeatable day that He has given to us along the way. If You Think You Have Arrived…You’re At The Wrong Destination! Have you met many Christians who mistakenly believe they have “arrived” in this life? When they complete the education that most only dream about getting? When they get the job promotion and that corner office that goes with it? When that special someone says “Yes” to their marriage proposal? When they are approved for the mortgage on a bigger and better home? When the car they drive drives their friends mad with envy? When the social circle they run in runs the city they live in? When the ministry they lead leads the other ministries in the number of people showing up? Yet on this side of the grave, the one thing the Christian never does is arrive. To be sure, there is only one place where we will finally arrive, and it won’t happen until we get to the other side of the grave, when we will forever be in the unveiled presence of Jesus. Is this the arrival you are anticipating? Is this the arrival you are hoping for . . . longing for? When we live in a state of anticipating our arrival in heaven, we are living in the light of eternity. Everything we do is measured against what will bring the most value and glory to the Kingdom of God, as we live like pilgrims who are just passing through on our way to the celestial city. As the apostle Paul says to the Philippians, our citizenship is in heaven, not here on earth (Philippians 3:20). So as we live in anticipation of that eternal glory, we pour ourselves out for the expansion of God’s big kingdom here and now, not the expansion of our own little kingdom. The devil would like nothing more than to convince you that you have indeed arrived. He has done it to countless individuals in the church. They profess Jesus as Lord, and yet put the stuff of this life on the throne of their lives. The devil even attempted to do the very same thing to Jesus! Our Lord’s response gives us the model for resisting the things of this world that would convince us we have arrived. The devil tried to get Jesus to think He had think of who He was and what He had – to think that He had arrived, but Jesus would have none of it. He knew what He was here to do and He would not allow anything to get in His way. With every attempt the devil made to get Jesus to think He had arrived, Jesus quoted Scripture. It’s important to understand that Jesus never told us to forsake everything in this life for what is to come in the next. The blessings and pleasure of this life are some of God’s good gifts to us. Education, professions, relationships, houses, and even cars are all good gifts given by our gracious God. However, these good gifts become bad gifts when we make them ultimate gifts. When we think we have arrived because of any good gifts we have been given, we have arrived at the wrong destination. I pray that these verses will serve to encourage you in your journey to the celestial city and your walk with Christ every step of the way, remembering that arrival happens not in this life, but in the next. Sometimes we get so focused on our intended destinations in life, we forget who we are supposed to be following. We set personal goals . . . professional goals . . . family goals. Goal setting is not only good, it’s completely biblical! Throughout Scripture we read of individuals who planned for the future, set goals, and worked toward accomplishing them – including Jesus. The key for the committed Christian is to set goals with God in view and to follow God with the goals in view. Proverbs 6:8 refers to the one who is not setting goals as a “sluggard” who cares not for the future. In fact, this sluggard is instructed to pay close attention to the ant, which “prepares her food in the summer, and gathers her provision in the harvest.” Goal setting is a good thing . . . just as long as we keep in view the One we are to be following. Surrendering to God and submitting to His will is the foundation upon which to set all of our goals, regardless of the area in life. When we are following God, we can rest assured that we will get to the place He wants us to get to and in the best way possible. That doesn’t necessarily mean the shortest way, or the easiest way, or the safest way! God took the Israelites the long way, the tough way, and the risky way through the desert in order to bring them into the Promised Land. And God knew exactly what He was doing the entire time. When it comes to goal setting and making plans, we must remember that it is God who has the final say in the matter. Peter learned this lesson well and often. After a full night of fishing without catching any fish, it was time to clean the nets and go home. At least, that was the goal Peter set. Jesus had other plans, and He told the disciples to go out into the deep water and let down their nets (Luke 5:4). You know the rest of the story: practically every fish in the lake swam straight into their nets! After Jesus told His disciples that He was going to die for them, Peter rebuked Him (Matthew 16:22) with what he thought was a better plan for Jesus to accomplish his earthly mission. Once again, Jesus showed Peter and the whole world that God’s plans are always better than our plans. And in Matthew 26 we find Peter saying to Jesus that “Even if I must die with you, I will not deny you.” And yet Peter did just that – not once, but three times, just a short time later. Jesus, of course, had the last word when He told Peter that He had prayed for him, and that when Peter turned back to Jesus he was to feed His sheep – stronger and more prepared for the work of the Lord than he was before he denied Him. So what plans have you made? What goals are you going after in life? What have you resolved to do and not to do? Remember: it’s not where you are going, but who you are following! And when you are following God, you are sure to get to His intended destination. It may not make sense to you, and it may be a whole lot harder than you thought it would be, but you can be assured that “He who began a good work in you will complete it …” (Philippians 1:6), regardless of the circumstance or obstacles you face. Here we see a great blessing that can easily be missed: the blessing of shouldering up under the burdens of another. We can be so caught up in our own lives that we miss a ministry opportunity right in front of our noses. How often we are busy being busy and miss the blessing of burden – bearing in the life of someone who truly needs our help. The priest missed it . . . The Levite missed it too . . . But not the Good Samaritan. There are a few remarkable things in the Parable of the Good Samaritan. First, the two characters who should never have missed the blessing of burden-bearing were the priest and the Levite. Both knew the Law of God and what it required of them, yet both of them went out of their way to keep from helping someone in great and obvious need. To the priest, the injured man was a problem to avoid. To the Levite, the injured man was an obstacle to get past. But to the Samaritan, the injured man was a person to come alongside of and shoulder up under the weight of his burdens. The priest missed the blessing; the Levite missed the blessing; but the Samaritan received the blessing of burden-bearing in the life of a complete stranger, treating him like a neighbor. Did you ever think about God having an eternal eraser with your name on it? It’s true! Just a cursory glance through the Bible shows us God using His eraser time and time again in the lives of some pretty messed up saints . . . saints like you and me. God erased the deceptions of Jacob. God erased the doubts of Thomas. God erased the denials of Peter. He is in the habit of doing it over and over again. Moses knew this from personal experience. He lived a privileged life in Egypt; at age forty he sought to bring about a “good thing” (the deliverance of God’s people), but in the “wrong way” (in his own strength through murder). You see, Moses believed his powerful, privileged position in the court of Pharaoh would propel him to the position of deliverer of his people. He was wrong, tragically wrong, and this would have been the end of the story, if not for God’s eternal eraser. After his failed attempt to free his people, Moses fled Egypt and headed off into obscurity, tending sheep on the back side of the wilderness of Median. For the next forty years, Moses undoubtedly thought many times about what could have been, believing he had completely blown the one chance he had to serve his God and bless God’s people. Satan delights in convincing the saints that they have blown their “one chance” of serving God and blessing God’s people. The devil wants Christians defeated, believing they have missed their opportunity of being used by God. Our adversary loves to discourage Christ’s disciples by convincing them they are disqualified for service in God’s kingdom. He convinces some that they are too bad; others that they are too poor; still others that they are too young or old. Satan keeps running into one problem, though: God always gets the last word! After Moses messed up, God sent him on his wilderness experience for forty years. All this time, God was preparing Moses for fruitful service: to go back into Egypt to deliver God’s people (a good thing), but this time to do it in God’s strength and according to God’s plan (the right way). God did not discard Moses and dump him on to the ashes of apparent defeat. Instead, He drove Moses into the desert for a season of preparation and training for future service. You know the rest of the story. Wow, what a difference God made! What about you? What will be the rest of your story? Are there any places in your life right now where you have lost all hope? At the office? In your marriage? With your children? In your ministry of service? We all must remember that our past never determines our future. Jacob’s life of deception did not determine his future. Thomas’s doubts did not determine his future. Peter’s denials of Jesus did not determine his future. He begins by first erasing our past. When we cry out to God for forgiveness, He not only forgives us, He forgets what He is forgiving. In Jeremiah 31:34, the Bible offers this great hope to those living in Old Testament times, who came to God in honesty and repentance, and asked God’s forgiveness, “For I will forgive their iniquity, and their sin I will remember no more.” We must do the same if we are going to get on with the perfect plan God has for imperfect people in advancing the cause of His kingdom. Your hope, your motivation, and your drive to continue pressing on in the call God has placed in your life will only be as big as the One you are trusting in. Moses learned not to trust in himself. Have we learned this too? Remember what the psalmist said: “Wait for the Lord; be strong, and let your heart take courage; wait for the Lord” (Psalm 27:14). God is not finished with you, and He won’t be until He brings you into glory. The sinner was reminded of being restored in relationship with God. Today, we need only one reminder: the cross! We are to daily remember the cross, where our Lord and Savior hung on our behalf and died in our place. Jesus paid the price and penalty for our sin once for all. We are totally free from the endless requirements of making sacrifices for our sins. The cross reminds us of this incredible truth . . . He meant what He said! The devil would rather have you be reminded of your past sins daily. He wants to keep you as a prisoner, chained to your painful past. DON’T YOU LET HIM DO IT! 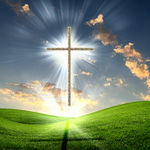 Keep the cross in view daily. Remind yourself of the powerful impact of the Gospel to your life. Remember what Jesus has done for you daily, and you will know the freedom and joy of what it means to be living under the banner of the finished work of Christ. In our high tech / high speed world, we tend to live life fast that we can miss the little things that bring big blessings. When was the last time you took in a sunrise or sunset? When was the last time you took a walk outdoors and felt the gentle breeze on your face or walked along the shore with the waves gently washing over your feet? When was the last time you had a family meal without any outside distractions, like phones or TV? Finally! A word of wisdom that tells us there is more to life than increasing its speed! God has given us this gift of life to be enjoyed. Gladness is to fill the heart as much as food and drink fill the stomach. If we don’t take the time, time will take us, and it will take us to a place we never intended to be. We all know what it is like to be living a life that is demanding, depleting, even incredibly discouraging at times. That is why God has commended the enjoyment of life to everyone who is living it. And that includes you! There is great enjoyment to be found in the mundane moments of life, because there is a great God right in the middle of it. God is in the soothing sound of ocean waves, the refreshing smell of a cool breeze, and the unexpected greeting of an old friend. Life in Christ is for enjoyment, not enslavement! Joy will accompany us in our work when our toil is being done for the glory of God. Sure, some days seem like they drag on forever, without any visible signs of fruit. We find ourselves careening from wall to wall . . . and we have countless bumps and bruises to prove it. But through it all, God says we are to enjoy the journey just as much as we look forward to enjoying our promised destination. Take a moment to think about some of the “little things” you may have been neglecting and missing out on. There really are no mundane and ordinary moments in life. With God, all of life becomes special and exciting! Time is short! Life is fleeting. Eat, drink, be glad, surrender to God, and accept Jesus as your Savior … this will help you make the little things big – and joy will accompany you in all your toil throughout all the days of the life God has given to you. Today we are going to take a brief look at a statement from Jesus that seems absolutely crazy; nevertheless, it is infallibly true. When we think about being blessed of God we generally don’t think about the blessing of persecution. In fact, it seems just a little bit crazy doesn’t it? But Jesus, for whom it is impossible to speak untruth (Hebrews 6:18), said it is true: we are blessed when we are persecuted for righteousness. We think about the blessing of financial prosperity. We think about the blessing of good health. We think about the blessing of obedient children. We think about the blessing of faithful friends. But when was the last time you considered yourself blessed to be in the middle of persecution? The Bible makes it clear that those persecuted for Christ’s sake are indeed a blessed people who should rejoice and be exceedingly glad. Now the persecution Jesus is speaking about is for righteousness, not for foolishness! The Bible says in 1 Peter 4:12-16, “Beloved, do not think it strange concerning the fiery trial which is to try you, as though some strange thing happened to you; but rejoice to the extent that you partake of Christ’s sufferings, that when His glory is revealed, you may also be glad with exceeding joy. If you are reproached for the name of Christ, blessed are you, for the Spirit of glory and of God rests upon you. On their part He is blasphemed, but on your part He is glorified. But let none of you suffer as a murderer, a thief, an evildoer, or as a busybody in other people’s maters. Yet if anyone suffers as a Christian, let him not be ashamed, but let him glorify God in this matter.” Many times we endure persecution simply for being foolish – making poor choices or bad decisions. This is the result of being sinners, both by nature and habit. In the passage above, Jesus is talking about those who are living surrendered, sold-out lives for His sake and because of it, bring on persecution from those who know not the Christ and hate the things of God. The world hates Jesus! If you are following Him and witnessing for Him, persecution in many different forms should not only be expected, but welcomed. I remember hearing Dr. R. C. Sproul discuss Jesus’ words in Matthew’s gospel during a Pastor’s Conference: “If you are not being persecuted for following Jesus by the watching world, you might want to take a look at just how closely you are following Jesus.” Those who are being persecuted for righteousness sake, understand that rejection is the natural response of those who have rejected Jesus; slander is the natural response of those who have slandered Jesus; misunderstanding and hatred is the natural response of those who have misunderstood and hated Jesus; false accusation is the natural response of those who have falsely accused Jesus. The kingdom of this world will be standing up against us. There are those who will do just about anything to avoid any kind of persecution. They won’t even tell a neighbor about Jesus, or speak about His love and live in public, for fear of rejection or being removed from the invitation list to social events. But mark this truth: there is a special blessing that can only be found on the other side of persecution for righteousness sake. The first blessing is to be identified with the suffering of Christ and the kind of character that produces in us. The incomparable Charles Spurgeon wrote, “Afflictions are often the black foils in which God doth set the jewels of His children’s graces, to make them shine the better.” The second blessing – our great reward in heaven – will be found on the other side of the grave. Crazy . . . but true! To know that God is not finished with us yet is to know an incredibly comforting truth! Until we leave this life, we all will be under construction . . . a work in progress . . . and that means we all will make mistakes along the way. We all need this Gospel-reminder daily. God is the One who began the work in us and is also the One who will complete it. Because of this, we can rest in our redemption, knowing the power for positive change is found in the promise itself, “for it is God who works in you both to will and to do according to His good pleasure.” (Philippians 2:13) What God promised to do He will carry out. Nothing can stop Him. Nothing will get in His way. Now, to be sure, it may not happen the way we expect it to happen or within the time frame we would wish for, but what God began He will most certainly complete! I think we find this truth easier to swallow when it comes to applying it to ourselves . . . but it is much more difficult to apply to others! All too often the patience we’re willing to lavish on ourselves suddenly turns into impatience when it comes to the lives of others. Or we may lapse into allowing fear to overcome our faithfulness, and we end up becoming a source of tension and discouragement, rather than peace and encouragement. How we need a daily dose of Gospel-sanity, just like the one the apostle Paul gave to his Philippian brothers and sisters! Remembering that everyone is under construction is the key to accepting their place in His story, knowing that it is God who is writing it. How freeing to know the pen is in the hand of God! He alone is responsible for completing what He started. And what He has said, that He will bring about; what He has planned, that He will do (Isaiah 46:11). The Bible tells us that the Gospel grace that saves also sanctifies us. God does not raise us from death to life by saving grace and then expect us to make progress by the spiritual sweat of our brows. Yes, there is much for us to do along the way to glory. God identifies the “spiritual disciplines” (Bible study, prayer, church attendance, service, etc.) as the means He is pleased to use in completing what He began in us. But we must remember . . .
We are completed by the good God who calls us to do them. Only the Gospel frees us to see ourselves as we truly are – broken and incomplete sinners in daily need of our Savior; as well as seeing all others as they truly are – broken and incomplete sinners in daily need of the Savior. We are all under construction!